← ONE MONTH OF POSTS!!! Why did you go Veg? Originally it was because my friends were vegetarian – I was a teenager. That was a while ago, though. I’ve been vegan for longer than a lot of my friends have had pubic hair. I realize that’s a weird comparison, but it works. What was your favorite thing to skate and why? I like skating bowls because I feel like I have a lot of room. What shoe are you skating in now? Converse, all the time. Or just say whatever you want. I find it to be a really discouraging social barrier to go to a skate park and see only dudes there, or to see women as only spectators. 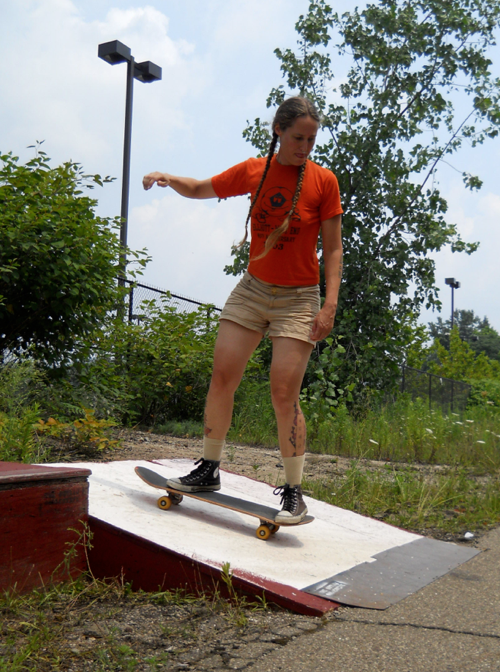 I try to encourage girls and ladies to skate whenever possible. Or anyone who feels intimidated at the skate park. I know what it’s like, so whenever someone tells me they feel like they’re too old, or not good enough, or haven’t skated in a long time, I tell them that I often feel that way too, so we should go to the park together. I know skating gets seen as an individual sport, but I feel like for me it’s been just as much social as individual. I’m stoked that I’ve been able to amass a posse of friends who are good skaters but also supportive of me and each other. I try to pay that back by being supportive of people I meet that want to start/continue skating but have some kind of social block about it. The way I see it, people feeling comfortable at a skate park is a positive step for everyone.